The third-generation Honda City has just been given a new lease of life. And a price cut for the base variant. Prices now start at Rs. 6.99 lakh for the Honda City “Corporate Edition” and go all the way up to Rs. 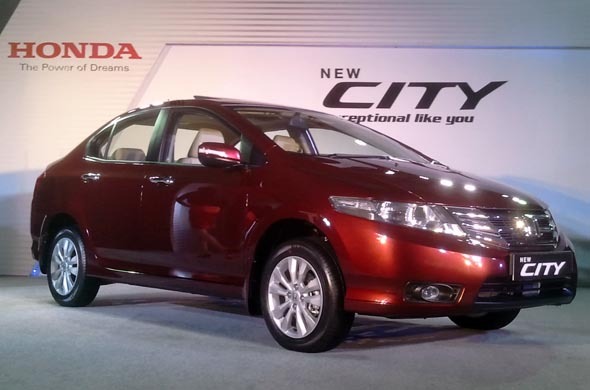 10.22 lakh for the top-end Honda City V AT/SR, with a total of seven City variants. The new pricing of the City makes it even more competitive against cars such as the Honda City and Volkswagen Vento, given that the City has been overtaken in sales by these cars in the market. Also the fact that Honda still does not have a diesel engine in its portfolio, and will not likely have one till 2013, means that the company has to make its existing petrol City as attractive as possible to stay competitive. The changes to the car are largely cosmetic, but Honda has increased its model line up to a total of seven variants of the Honda City, giving customers more choice. Here’s what’s new with the Honda City. Electric sunroof: The Honda City V MT and V AT variants can also be bought with a sunroof (priced at Rs. 9.50 lakh and Rs. 10.22 lakh respectively). The electric sunroof has a tilt and slide function. 10-spoke alloys: The Honda City V variants get 10-spoke alloys, while the S variant also gets the older 5-spoke alloy design. Only the E and Corporate variants have regular steel wheels with wheel caps. Turn indicators on mirrors: The electric door mirrors on the V variants get integrated turn indicators. Plenty of chrome: Honda has given the new City plenty of chrome. The front grille is covered in chrome. The inside door handles are chromed. The AC control knobs are chromed. The door handles get chrome. The boot lid gets a chrome strip. New bumpers: The front bumper has been made slightly more muscular and has a fresh housing design for the fog lamps. The rear bumper too has been made more prominent and gets integrated reflectors. New tail-lamps: The tail-lamps have been redesigned to look like LED lamps, giving the car a contemporary look. Blue-backlighting: The instrument panel retains the familiar Honda City design, but the backlighting has been changed to blue. However, the backlighting on the integrated stereo (on the E, S and V variants) remains amber. Cruise control: The V variant of the Honda City now gets cruise control, with the controls located on the right spoke of the steering wheel. The S and V variants also have steering-mounted audio controls on the left spoke of the steering. More ground clearance: Honda has moderately increased the ground clearance of the City by 5mm, taking it up to 165 mm, in the hope that the car will comfortably clear some of those nasty speed breakers. Besides these features, Honda has slightly increased the length of the car from 4420 mm to 4440 mm due to the new bumpers, and the height goes up by 5 mm because of the higher ground clearance to 1485 mm. The City continues to be propelled by the tried and tested 1.5-litre i-Vtec petrol engine that puts out 116 bhp of power at 6,600 rpm and 146 Nm of torque at 4,800 rpm. The car is very peppy to drive and handling is quite sharp. The car comes with a choice of a 5-speed manual transmission or a 5-speed automatic transmission, with paddle-shift, increasing the ease of driving. Claimed mileage for the Honda City is 16.8 kmpl for the manual transmission variants and 15.6 kmpl for the automatic transmission variant. In real world conditions too, the Honda City is known to give consistently good fuel economy of 13.5 kmpl for the manual variant in the City and 11 kmpl for the automatic variant. Competitive pressures have forced Honda to keep cutting the prices of the City. It first cut prices on the City in June by Rs. 66,000 and then offered further price cuts and discounts of up to 70,000 last month on select models to make way for the face-lifted City. All variants of the Honda City come with key safety features such as ABS and two airbags, as well as an immobilizer. With the Corporate variant at just Rs. 6.99 lakh as the base variant, this car is very good value for money, as it comes with essential safety features and convenience features too, such as power mirrors, power windows and central locking, making it a good deal. With such aggressive pricing, the Honda City now makes itself an even better proposition for buyers looking for a peppy and comfortable petrol sedan. The City competes with cars such as the Hyundai Verna and the Volkswagen Vento, and at the price it’s being offered at, it is a good deal compared to both its key rivals.